A groundbreaking new miniature submarine in use by the US Navy's secretive, elite frogman-commando special operations force was actually designed and built in old Blighty, the Reg can reveal. 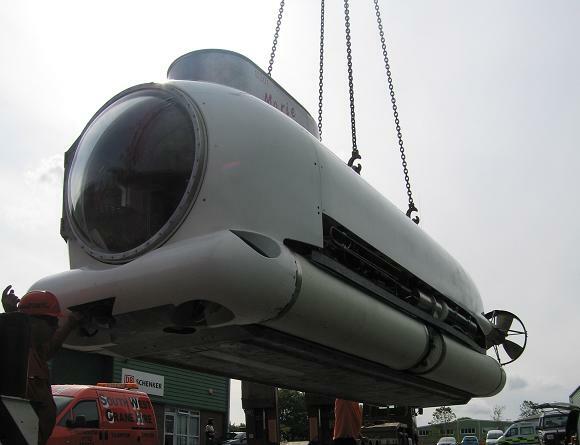 We reported first on the S301 mini-sub two weeks ago, noting from federal documents that the famous US Navy SEALs had leased a demonstration model for "doctrinal, operational, and organizational purposes". This was followed up last week by the Honolulu Advertiser, which had spoken to Submergence Group, the American firm listed by the US government as provider of the S301. It emerged that the S301 - now in trials with the SEALs in Hawaii - had cost just $10m to develop, which contrasted especially well with the $885m+ spent on the ill-fated Advanced SEAL Delivery System (ASDS). The stylish ride for today's more discerning frogman-commando. Needs to come in black, though. The ASDS, from US defence behemoth Northrop Grumman, had been intended to supersede the SEALs' current Mark 8 Mod 1 minisubs, which are carried in a "Dry Deck Shelter" (DDS) airlock docking bay fitted to a full-sized US Navy nuclear submarine - either a normal attack boat or an Ohio-class dedicated Stingray-style special-ops mothership. The Ohios, nuclear missile subs retired from their old job under arms-reduction treaties, have space aboard for a large force of SEALs and pack a powerful armament of conventional-warhead cruise missiles for precision shore bombardment. The trouble with the present Mark 8 minisubs is that their interiors are open to the sea and SEALs riding in them for long periods can be so chilled by the cold ocean as to be unable to carry out their mission once they are dropped off. Hence the ASDS, a bigger battery sub with a dry interior, which was to replace the deck hangar and dock with the mother sub directly. It had its own airlock, and so would be able to carry a team of frogmen to work in comfort, locking them out into the sea once it was close to the target. But the ASDS was dogged by technical snags and cost overruns: it tended to get damaged if the mothership sub went at all fast, and its battery system, we gather, was subject to "thermal runaway". The ASDS programme finally expired altogther when the prototype boat was gutted by fire while stored ashore in Hawaii.